Konecranes supplied a mobile harbor crane with a new drive concept to Weserport in Bremen in June 2018. Weserport uses the crane in Terminal 1 of Bremen's Industriehafen for loading and unloading general cargo and handling project loads. The new Model 6 mobile harbor crane in the G HMK 6507 two-rope variant offers Weserport a maximum lifting capacity of 125 tons and a radius of up to 51 meters. It features the new drive concept recently unveiled at TOC Europe 2018, one of the world's leading shipping, ports and terminal events. The drive concept incorporates Konecranes' proven hybrid technology, which includes a new 625 kW diesel engine in addition to electrostatic short-term energy storage media (ultracaps). Heiner Delicat, Managing Director Weserport: "With the mobile harbor crane from Konecranes, we have opted for a highly productive and eco-efficient crane with a new-generation drive system. The maximum lifting capacity of the new crane is more than twice as high as that of our old portal slewing crane, enabling us to develop and serve new areas of business. Our crane operators received training from Konecranes in Düsseldorf to exploit the crane's full potential. They value the crane's performance and, above all, its user-friendliness". Konecranes Gottwald Model 6 Mobile Harbor Crane from Weserport with new drive concept. 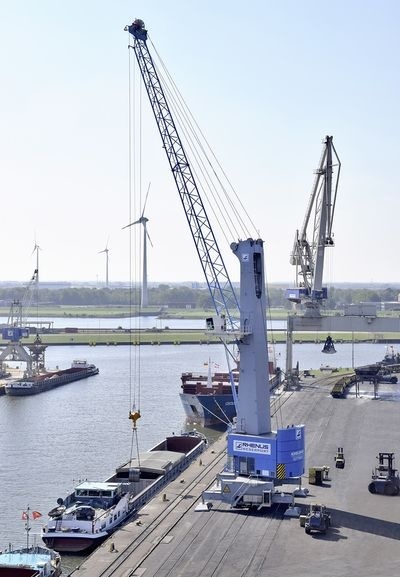 The crane has been handling general cargo and project loads in Bremen since June 2018. Konecranes с торговой маркой Lifting Businesses™ является одним из ведущих в мире поставщиков грузоподъемного оборудования и сервисных услуг. Наши заказчики - предприятия самого широкого ряда отраслей промышленности, включая предприятия машиностроения, металлургии, верфи, порты и терминалы.